The Meatball Shop has a bunch of different kinds of meatballs and different sauces for the meatballs, you can make your own meatball combos. 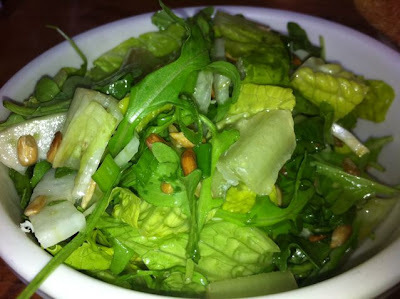 Before my meatballs I had an escarole salad with arugula and sunflower seeds. 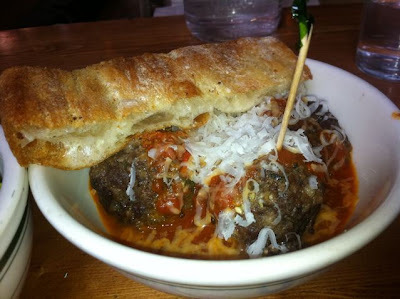 Then I had lamb meatballs with tomato sauce. Whenever I think of meatballs I think of the comedy bit that John Benjamin and Jon Glaser did where one of them was a dad and and one was the son. They kept calling each other "meatball"... "son, don't be a meatball!"... "I don't want to be a meatball dad".